New, modified design: Blue Fireball has reduced the maximum width of this adapter marginally, with the result that this adapter can now be fully inserted into a 2" barrel with zero optical length. 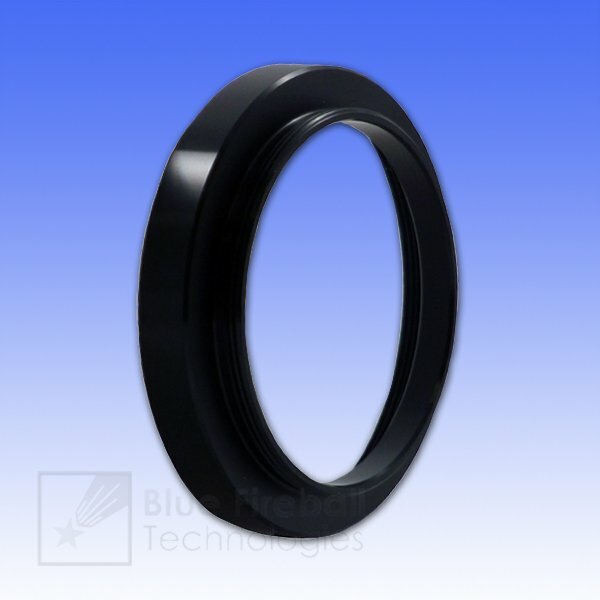 This adapter has a female 2" filter thread (M48x0.75) on one side and a male T / T2 thread (M42x0.75) on the other side. This adapter provided the perfect solution to using my CCDT67 focal reducer with my Baader T-2 diagonal and NVD Micro night vision device. 5.0 What&#x27;s not to love? I buy most of my astronomy gear from Agena. This adapter does just what it is intended to do. I have a 48mm male thread on my filter holder and a T-2 female thread on my camera, and this works great to mate them. Agena shipping was fast and the packaged arrived two days after I ordered it. This adapter is high quality and has the correct thread depth to fully seat a 48mm accessory for use on a T2 thread camera or filter wheel. I highly recommend! Ease of ordering and fast service. Adapters and such are usually an issue when making changes to equipment. Agena routinely has it to you in a couple days for a reasonable price. First place I look when I need these types of components. Lets me attach accessories with 2-inch filter threads to T-threaded accessories, while keeping the light path short. Review by www.skydude.me of San Diego, CA. Just what the doctor ordered to connect an AP CCDT67 focal reducer to an Orion OAG. The male T-threads connect to the OAG and the female M48 connect to the focal reducer. Nice short profile. Review by Aynali of Turkey, Izmir. Astrofoto canon 60d and meade ls8"
Review by Don of Denton, TX. 5.0 Works just like it's supposed to. Used this to attach an AP Focal Reducer. Worked well.